OK, these booties have just charmed the socks off me. Click on the picture to get to the pattern at Knitty.com. Which has more pictures! YAY! The Knitting 4 Children group strikes again!! I got the link to this (and a few other delectable babies things) in the digest. And now, of course, I’m going to be suffering yet another bout of promiscuous behavior…NO! Must. Finish. Vest. First. Oh my god are those cute!!! 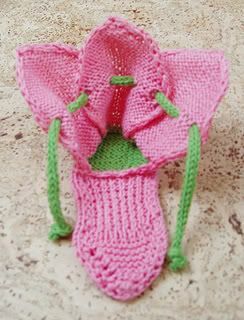 Wish I had a little girl to knit them for!!! Thanks for the comments on my blog!!! My daughter came home from school today and we took her to the Dr.'s and she now has the start of pneumonia......EEE GADS!!! UCK!!! OMG those are so sweet they are raising my blood sugar!